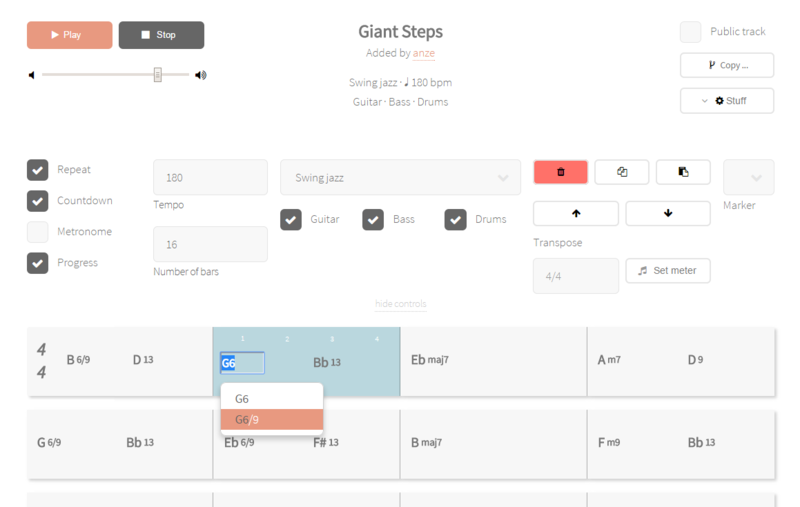 The Major 7 - A backing track generator that runs in your browser! Practice your playing with the help of simple and easily creatable backing tracks. TheMajor7 is a professional and easy-to-use backing track generator web app. Create your own realistically sounding backing music and improve your soloing skills. Perfect for singers or for practicing jazz and blues guitar/bass. Create a simple backing track in a matter of seconds by choosing a desired playing style and entering the chord changes. Even more complex compositions should present very little trouble. You can also download backing tracks to practice offline! Play along your own songs, or practice over free backing tracks created by our community, ranging from jazz and blues to reggae. Users can create backing tracks of various length in several different styles and tempos. All tracks can be shared publicly - enabling the sharing of tracks, opinions and tips. More on prices and features. You don't have to register to listen to tracks made publicly available by our community. Have a listen to one of the tracks below. Sign up and start jamming to your own tracks for free!